Bug Juice is an insecticide paint additive designed to eliminate crawling and flying insects on interior & exterior surfaces. The active ingredient in Bug Juice is Deltamethrin. WHERE CAN BUG JUICE BE APPLIED? Bug Juice can be applied on most interior and exterior surfaces, including kitchens and pantries. DOES BUG JUICE REPEL BUGS? Bug Juice does not repel insects. It is a contact pesticide which poisons the insects and begins to work after an insect makes contact with the treated surface. WHAT KIND OF BUGS DOES IT KILL? 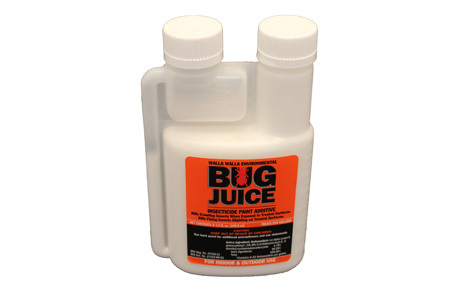 Bug Juice kills crawling and flying insects ranging from ants to mosquitoes and crawling insects ranging from cockroaches to silverfish. Bug Juice will not affect the color, surface appearance or drying time of the coating it is mixed with. Hose off exterior treated surfaces with water twice a year to remove buildup of pollen and dirt. DOES BUG JUICE HAVE AN ODOR? No. Bug Juice has no odor. HOW LONG DOES BUG JUICE LAST? Bug Juice will typically last for two years when mixed with stains or paint. WHAT TYPE OF COATING CAN BUG JUICE BE MIXED WITH? Bug Juice can be added to any oil or latex based paint, stain, or sealant. IS BUG JUICE SAFE TO USE? Bug Juice is the result of a six year research and development program conducted by the manufacturer, Walla Walla Environmental. The product is registered with the US Environmental Protection Agency for both interior and exterior use. The product is safe for consumer use when used according to directions. It is approved for use in hotels, restaurants, hospitals, kitchens and pantries. HOW MUCH Bug Juice DO YOU NEED? One/8oz bottle per five gallon container of paint or stain. IS BUG JUICE COST EFFECTIVE? Bug Juice is extremely cost effective when compared to the cost of regularly scheduled temporary pest control measures. During the past year the EPA has been in the process of eliminating all of the "cost effective" pesticides for consumer use - therefore you are left with safer, but more expensive pesticides. At the present time Bug Juice is the only insecticide paint additive available.